610 x 610 x 254mm deep with 6mm plate base, manufactured from prime mild steel with welded anti-splash rim all round. The gas-fired pans also have a specially designed ducting system which enables the hot waste gases to be circulated evenly around the pan bases before being ducted out, hence saving on fuel costs. Fin-bladed burner using only 19.8kw per pan per hour. It takes just 7 minutes to cook a pan load of chips with immediate recovery time. High specification lagging increases pan efficiency and ensures all working surfaces are cool to the touch. All ranges have an interlocking safety system comprising of flame failure device, secondary hi-limit safety thermostat, safety shut off mechanism and air proving system fitted as standard. Fitted with high efficiency infrared elements. 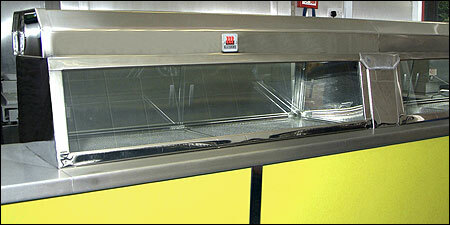 The cabinets are easily removed and dismantled for cleaning and maintenance. Heated by high efficiency infrared elements top and bottom thus maintaining an ambient temperature. 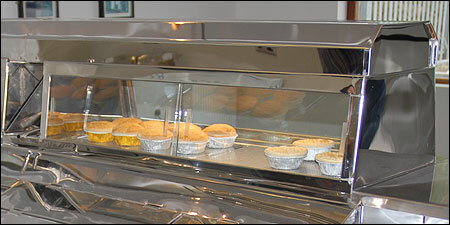 The electronic controls to fish and chip boxes allow infinitely variable heat control from zero to maximum. 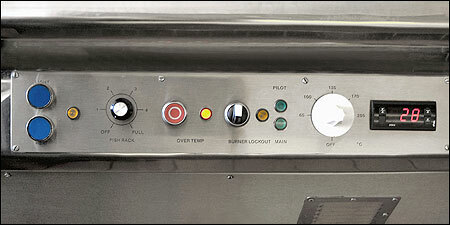 All controls are mounted on a panel at hand level. Heat and lights independently controlled. All counter tops are manufactured from 1.5mm stainless steel sheet with heavy duty alloy under shelf for storage of paper, etc. 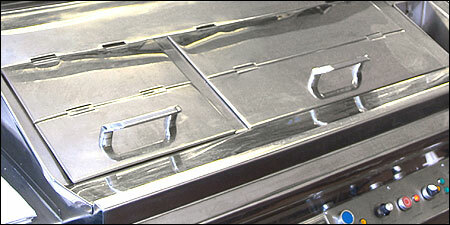 Mirror polished 0.9mm stainless steel sloping top with flip lids making easy cleaning. To customers specification, illuminated if required.